Seville is chock full of festivals all year round, and it is true that nobody has a fiesta quite like Spanish people do. Festivals in Seville are varied and fun, ranging from religious to full-on parties. Despite the wide variety of festivals, though, one thing is common – the people of the city come together, and everyone has a great time in the streets. That’s why it’s the perfect opportunity to visit Seville and truly experience the city to the fullest and the way that the locals do. The first festival in Seville to be mentioned is the one that the city is probably most famous for – the Feria de Abril, which obviously takes place in April each year. For one week, the entire city celebrates together within the city’s sprawling fairgrounds, where there’s something for everyone. The children flock to the rides, and everyone goes to their own caseta, or tent, to dance a special type of flamenco called sevillanas, drink rebujito and enjoy being surrounded by friends and family. People in Seville take the Feria de Abril very seriously, and most women dress themselves in beautiful flamenco dresses of all kinds of colors and styles. One of the best parts of feria is the simple act of people watching, seeing the exquisite dresses and dances the people of Seville have known since they were little. 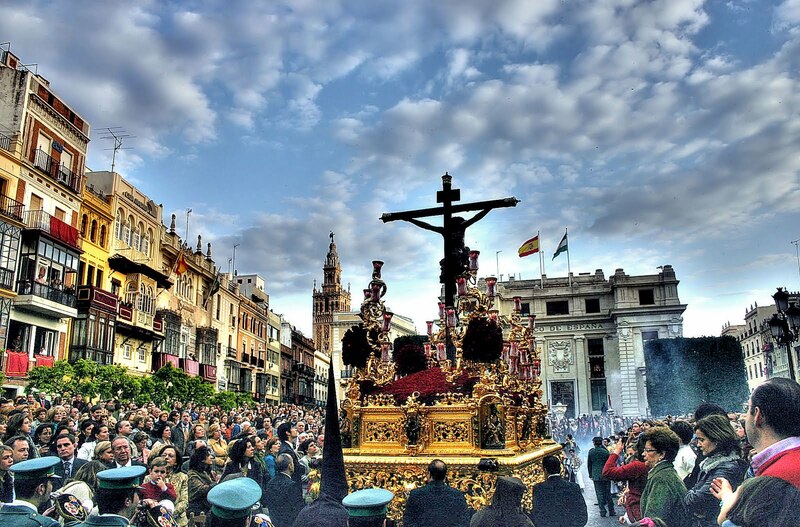 Another huge celebration in Seville is the festival known as Semana Santa, which is actually quite popular all throughout Andalucía. This weeklong Holy Week festival is full of somber processions where men carry heavy pasos that hold intricate statues of Jesús and various virgins. Because the floats are so heavy, and they’re all carried by the simple strength of the people, they move quite slow. These slow-moving processions paired with the distinct somber music of Semana Santa create a very unique experience, and seeing it for yourself really helps you get a much deeper understanding of Seville’s culture and history.